Lessons learned from Lego’s business renaissance could be the way of the future for fintech innovation. At yesterday’s (7 September 2016) Avaloq Community Conference at the Seminarhotel Bocken in Horgen, Switzerland, the private banking software specialist held an open day as it looks to the future. Our first report included an exclusive interview with CEO Francisco Fernandez and looked at the morning sessions – where Avaloq said it can be the iTunes for finserv. In the afternoon, a witty and riveting presentation by David Robertson from the Wharton School of the University of Pennsylvania, and co-author of the book “Brick by Brick”, explained how Lego dramatically turned its business around after facing financial meltdown. Robertson pointed out how the famous toy manufacturer’s patents have actually expired. Anybody can make the bricks, yet the Danish company has prospered due to its brand strength, refusal to become complacent and constant bouts of creativity. There is too much to mention from the speech but his masterly delivery and amusing slideshow had the audience enthralled. It was the best presentation I have seen at any fintech event around the world. He discussed the difference between creativity and innovation and then looked to Lego’s past, where in 1970 it created Duplo – a new chunkier and safer brick for children. That’s not the point – Robertson says the new brand and new business unit helped to energise its business. It opened a new market. Lessons that can be applied to fintech, in his opinion. From 1978 to 1993, Lego grew year-on-year by 14%. It had diversified its range of products. Not all worked – but its willingness to experiment was a sign of creativity. However, in 1993 all this stopped and it reached a plateau. The firm then brought in a turnaround expert to stop the losses and made 1,000 job cuts. It was this quick (and ruthless) reaction that ensured Lego survived. The voice of an outsider could also be seen as an innovation. Robertson says Lego is “not just a toy but a story”. It is “not just enough to create products – companies need to think about different dimensions or events”. He calls it the “innovation piano” – where “some companies play one key, but need to play multiple keys”. A fine show from Robertson and sadly much had to be omitted in this review. Whether firms learn from the Lego analogy will be interesting to watch. Robertson’s presentation was later in the day and a fitting finale to the Avaloq event. Earlier there had been a live demo and explanation by Avaloq of the “omnichannel client journey in 2017”. This was a chance to showcase Avaloq’s tech in use on a banker’s dashboard. A customer looking for specific brokerage deals could do almost everything on their mobile. A lot of the processes were automated – such as checking a slot is free in the branch’s calendar or receiving a credit card. The live demo was a nice touch as the audience could vote to decide where the “actors” went or what actions they should carry out. This was democracy in action. A “Swiss vote” as Avaloq called it. As with every event, much analysis of other presentations and discussions have been omitted for brevity. 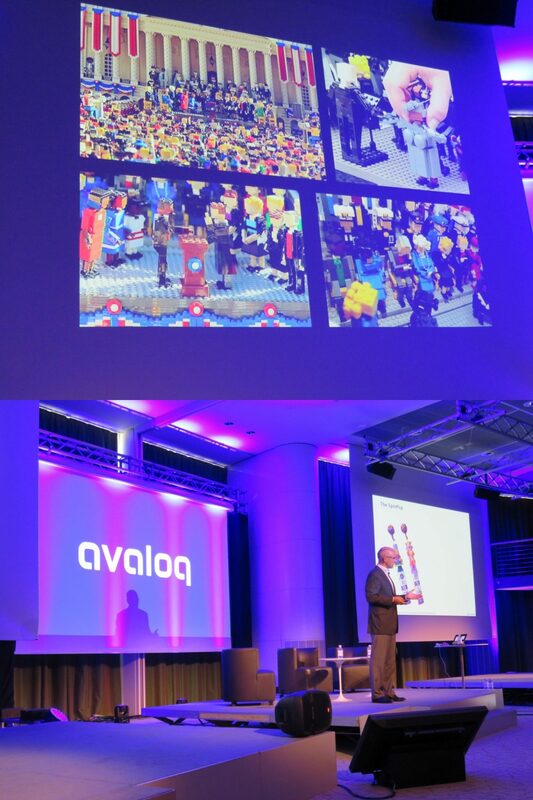 I attended Avaloq’s Community Conference last year, and this year ran as smoothly as that one. There were slightly over 300 people in attendance and it certainly was a success. As with 2015, Avaloq is still saying it wants to work with start-ups. However, unlike one of its main rivals it doesn’t have an “innovation jam” – where start-ups can compete and pitch their ideas. Perhaps Avaloq is already planning one of these innovation-style events for next year to show that it is working or talking to start-ups. We’ll wait and see.